Congratulations to the Oregon Health Science University Nursing Class of 2007, nursing's future leaders. On May 31st, Teri and Alisa presented the Office of the National Nurse as part of the photographed student's group project for their Leadership and Health Policy Class. You can still watch the videostream of this presentation that was taped earlier at Portland Community College for a National video teleconference. For those with a MAC computer, please try this link. 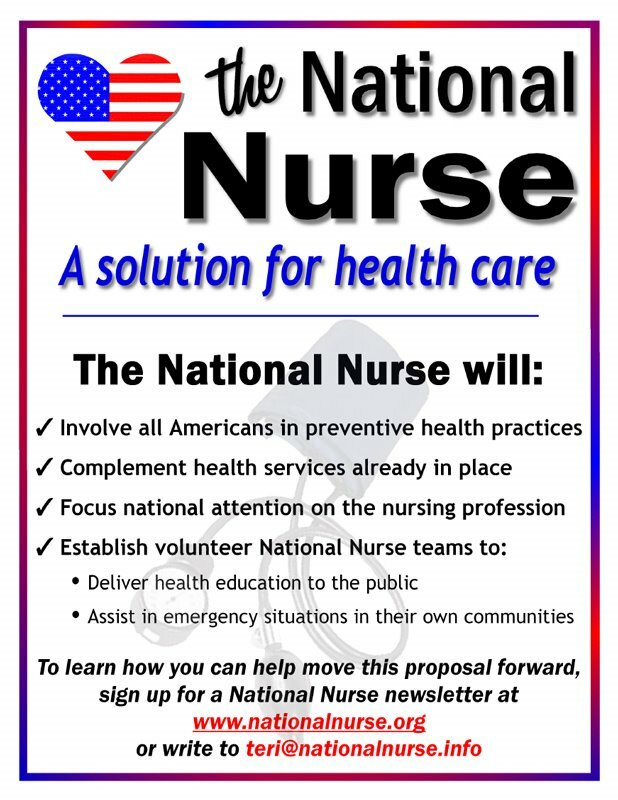 The National Nursing Network Organization is based on the principles of grassroots campaigning, and that means that each of you is capable of making a difference in educating others about the National Nurse Initiative. Thank you to Kathy Palilonis RN BSN, Director In-Service Education at Immaculate Mary Home located in Phila,Pennsylvania who created this poster board in honor of National Nurses Week. Meanwhile, on the other side of the country, Susan Sullivan MSN, PHN for displayed this posterboard in Orange County, California. Up north, in Portland, Oregon, nursing students used the posterboard concept to educate others about the health services available to their patients in the Portland Metropolitan area. 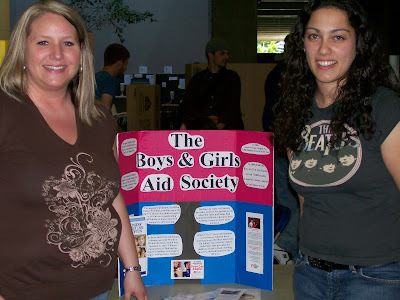 Pictured from left to right are Shannon Munden and Theresa DeMello. Finally, there is a lot of merchandise for sale at www.cafepress.org/nationalnurse including larger versions of this poster, buttons, bumperstickers, mousepads, teeshirts and mugs. Proceeds from these sales helps to support the lobbying efforts of the National Nurse team, including payments for the website domains (the National Nursing Network owns www.nationalnurse.org, www.nationalnurse.info, www.nationalnurse.net, www.nationalnurse.us) and the emailed newsletters. If you would rather send a direct donation to the campaign, click on the Donate Now button in the upper left hand corner of the screen. The Board of Directors thanks you for supporting the efforts to create an Office of the National Nurse. History: HR 4903 was the original BILL introduced in the last session (109th Congress) to create an Office of a National Nurse. HR4903 RECEIVED 42 CO-SPONSORS, but it was not enacted into law AND HAS NOW EXPIRED. The National Nursing Network Organization is currently working with legislators to reintroduce this important initiative in the 110th Congress as endorsements for the campaign continue to come in. The most recent is from the Association of Nurses in AIDS Care as they too recognize the merit in establishing an Office of the National Nurse. The Board of Directors of the National Nursing Network Organization extends its heartfelt appreciation to the national Association of Nurses in AIDS Care (ANAC) for their support to establish an Office of the National Nurse. Nurses working with HIV positive clients understand the importance of prevention so that we can stop this epidemic here at home and internationally. On behalf of the Association of Nurses in AIDS Care (ANAC), the national nursing organization and leader in response to HIV disease and AIDS, we enthusiastically add our support of creating an Office of the National Nurse and urge that you reintroduce legislation to establish this position. A primary mission of ANAC is to meet the needs of nurses as they relate to HIV/AIDS care. An Office of the National Nurse would provide our nurses with the platform necessary to advocate for improvements and advances in care for our patients. In addition, this office would provide opportunities for nurses’ voices to be heard regarding important and essential health care related issues. As you are aware, nurses are the largest group of health care providers in the nation. In addition, they are the most trusted. As nurses highly committed to our profession and our patients, we endorse this concept wholeheartedly. Thank you to Dr. Donna Maheady and the Board of Directors of Exceptional Nurses, an advocacy group for the thousands of disabled nurses and student nurses in the United States, for their endorsement of the National Nurse Act of 2006. 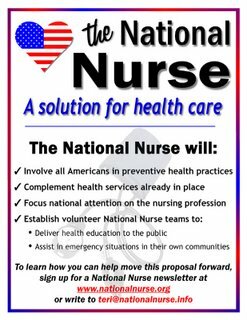 On behalf of ExceptionalNurse.com, a nonprofit resource network for nurses and nursing student with disabilities, please accept our support and endorsement of HR 4903, the National Nurse Act of 2006. Exceptional Nurse is committed to inclusion of more people with disabilities in the nursing profession. By sharing information and resources, ExceptionalNurse.com hopes to facilitate inclusion of students with disabilities in nursing education programs and foster resilience and continued practice for nurses who are, or become, disabled. As a national advocacy group for nurses with disabilities, we support the education and employment of countless nurses with disabilities. Nurses with disabilities bring unique talents and life experiences to nursing care. In addition, nurses with disabilities can be powerful role models for patients by demonstrating the potential in all of us to maintain health and wellness in the face of adversity. Our organization‘s mission is to advocate for nurses and nursing students with disabilities and to maximize their potential. A national nursing office, a visible symbol, representing all nurses will help with recruitment and retention of nurses. It is a privilege to add the voice of thousands of nurses and prospective nursing students with disabilities to this effort.